I don't like this ad because it sounds so lame. Why does it sound lame? Why not? Today is Day 220 of the project. Why don't they start working on it so we get it!!!! Why don't they make it work in my computer room, I live on a top floor and it doesn't work. Why not start working on it. Cool Ad, it should be their new slogan to fix their network. Look at all those shabby old buildings. I think they are going to be demolished soon and replaced with high-rises. 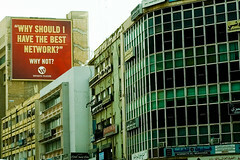 Because it should've said "Why should I have the best MOBILE network"
why not indeed? do we have a choice? until such time that the government does something about this duopoly of private phone networks, then subscribers can really enjoy the services at a lower rate. Same goes for the ISP's in this country. they are one of the most expensive, if not the most expensive!